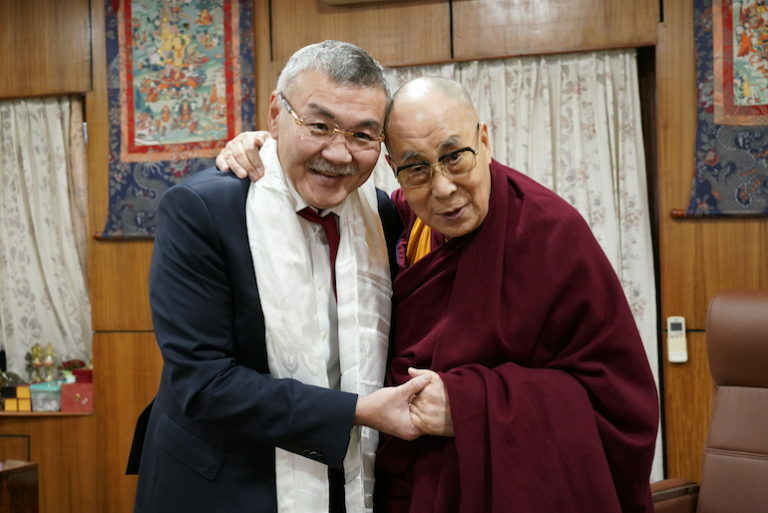 (TibetanReview.net, Dec02, 2018) – President Aleksey Orlov of the Buddhist-majority Russian Republic of Kalmykia has on Nov 30 called on Tibet’s spiritual leader, the Dalai Lama, at his exile home in Dharamshala, India. He was accompanied by Representative Telo Tulku Rinpoche at the Office of Tibet, Moscow. The latter is also the spiritual leader of the Kalmyk Buddhists. The meeting was stated to have lasted half an hour with the Dalai Lama recalling the historical, cultural and spiritual ties between the peoples of Tibet and Russia. He has also underlined the shared Buddhist heritage of the two sides dating back to the 17th century. The Dalai Lama has emphasized the need for those calling themselves Buddhists to be 21st followers of the faith, studying the teachings of the Buddha based on logic and investigation. He has spoken about an ongoing drafting of a project on a secular ethics curriculum for schools in the Republic of Kalmykia and urged its visiting President to effectively introduce it after its completion. Orlov was also stated to have met with President Lobsang Sangay of the Central Tibetan Administration. Though Russia’s Buddhist communities have been urging for a visit by the Dalai Lama for years, the latter has been unable to do so due to China’s pressure on Moscow to prevent a visa being issued for him.